If you like nopales, you will like this recipe. I made the recipe with the chiles de árbol using only 2 chiles. I used queso fresco and fried chile salsa. The salsa was not my first choice but was what I had the ingredients for. This is a great taco for people who like nopales; a good, non-slimy taco for those who've never had nopales; but it's not so special that it will convert nopales haters. Used fish sticks instead of frying. Worked out great. Spices seemed to overwhelm fish, but it turned out great. Good taco variation. I used leftover roast duck, which made for quick preparation. I made this with leftover duck meat & duck fat (from roasting a duck). I enjoyed the mix of flavors; with the thyme, orange, and cinnamon it is different from most taco seasonings. With leftover meat, it is also quick to prepare. 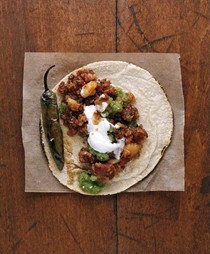 It is hard to go wrong with chorizo and potatoes together, and these tacos were delicious. If you have spicy chorizo you may not need the additional chiles the recipe calls for- just adjust to the spice level that works for you. The recipe doesn't specify draining the fat after cooking the beef, but you should- it is way too greasy otherwise. Maybe the fat muted the flavors, but I thought this was kind of bland for a picadillo. Outstanding! I will go back to this often. Used ham. Turned out great. This was a very flavorful torta. You start by making a green pipian sauce. I used fresh hoja santa (just less than a cup) rather than the specified dried, and I only used two serrano chiles, seeds and all, rather than the four called for in the recipe. I made this the day before (a Sunday) since it was planned for a weeknight, and then just needed to heat it up with already cooked chicken and build the sandwiches. I wasn't a huge fan of the refried beans here (maybe I would feel differently if I had added more chiles? 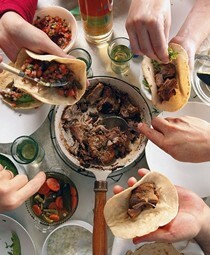 ), which are supposedly needed to keep the tortas from becoming soggy. I felt like my sauce was thick enough that the sandwiches would have been fine regardless. To me, this was all heat with no complexity of flavor. Others seemed to like it, but I would not make this again. This salsa has a wonderful flavor profile but it didn't convince me that I want a smooth salsa on my taco. Give me more texture. Perhaps, I'll be convinced when I try it on a torta. Delicious. Used Tajin instead of chile de arbol, and I really liked that seasoning for the beans. I made this using ingredients on hand (so skipped the flaked coconut and used coconut milk and evaporated milk in place of milk and heavy cream). The flavors were great- it is genius to cook the rice initially in water with canela because it really perfumed the whole dish in a beautiful way. I found the cooking times to be way off- perhaps because I am currently cooking at altitude and am unaccustomed to making adjustments, but my rice needed hours more cooking (yes hours) to really soften and thicken the pudding and to set. Also, it seemed to be a lot of liquid going into this recipe-I ended up not using about 1 1/2 cups of the dairy called for because I was worried it wouldn't set, and as a result it wasn't nearly as creamy as I wanted. I don't like bananas, but I made this for my husband's birthday and he enjoyed the combination of cajetas with the bananas. I didn't have vanilla so I subbed an equal amount of rum. This is definitely a cooking for a crowd recipe-it makes a ton. ...Santibañez always aims to teach. He supplies the essential techniques, using the recipes as examples, and then it's up to you to make these dishes your own. Discover the flavors of Mexican street food in your own kitchen! Americans are having a love affair with the taco. What began as affection for the fast-food version--that hard yellow shell filled with ground beef and mysterious yellow cheese--has blossomed into an all-out obsession for the real thing, with upscale renditions and taco trucks popping up from coast to coast. 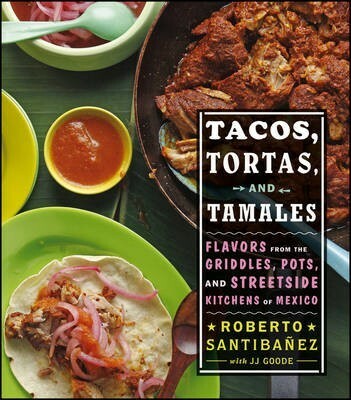 Now, with Tacos, Tortas, and Tamales, chef Roberto Santibanez shows you how to recreate the thrilling, authentic flavors of the taquerias of Mexico in your own home. In addition to tacos, the book also explores the equally exciting Mexican sandwiches called tortas and hearty tamales, as well as salsas, condiments, fresh juices, and even desserts and refreshing margaritas. * Using easy-to-find ingredients and simple techniques, this is the perfect introduction to real Mexican cooking for enthusiastic beginners and experienced cooks alike While the flavors you'll find here are exciting and complex, the cooking itself is anything but complicated. With Tacos, Tortas, and Tamales on your kitchen shelf, dinner will never be dull again.